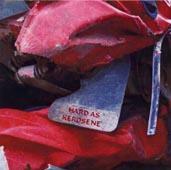 Hard as Kerosene - "s/t"
Here's some good smokin' free jazz-rock with a large dose of effects and electronics! The opening seconds of this CD-r immediately had me thinking of W.O.O. Revelator - a group more than a few Aural Innovations readers should be familiar with. Hard As Kerosene is a perfect band name and title for this style of music. The name conjures up ideas of burning metal and very industrial styles. Overall the sound is aggressive (to say the least), but a strong punch on the delay pedal allows for some space preventing the music from falling into a mess of noises. The musicians names are all new to me, though the press sheet makes them sound like learned veterans (as it should) - which is fine since they certainly don't come off as novices. Nick Hamlyn sticks mainly to guitar, though proves himself quite the adept bassist, while also adding some electronics plus light vocal duties. I enjoyed his playing, and when I hear music of this sort I yearn to see it performed before my very eyes so I could further discern who is doing what and when. It would be interesting too see Hard as Kerosene live as this album has extensive multi-tracking so it certainly would be different. Richard Powell plays a large part on this album spanking the skins and skronking away on the sax, and also adds some vocals and synths. I will say it is Powell's use of delay and feedback with the sax that most intrigues me in Hard as Kerosene's sound. This amplification and use of effects is neither a singular person's development, nor is it the latest innovation, but it remains one of this instrument's more interesting advancements, and others with an attraction to this process would do well to give Powell a listen. Angus Wallace is listed as supplying treatments - not sure if this means electronic effects or studio engineering or what - so I'll just leave it at that. The album starts rolling along with the third track, "2 Minutes Silence". Though it takes it away from the opening onslaught of the first two tracks, and is quite different from anything we will hear further, each preceding piece of music builds on this direction. "2 Minutes." in an odd way reminded me of Gang of Four - a rather slick monotone delivery with a grooving bass line and some call and response recitations. Obviously my earlier mentions of free jazz-rock do not apply. Still it is a standout track! The longest track, "To Keep From Falling In", shows the group playing as such - a group and is composed mainly of guitar, bass and drums. Plenty of room is allowed for ideas to develop and this is the spaceiest improv on the recording. This mood is continued with the following track, "Salamander", though now we have Powell multi-tracked playing drums and sax with great electronic effects swirling above and below the main ideas. I think I would have shuffled the order as the two opening pieces provide a high driven attack, this theme is unfortunately never returned to. The meat and bones of the album is found in tracks 4-7 totaling over twenty-seven minutes and though, it flows very easily, I'm not positive that is such a great thing. I'd prefer there to be a bit more of a change in tempo. At the very least, they could offer some different ideas, as after three tracks of fairly spacey slow paced improvs a change would prove more than somewhat cathartic. Still if you enjoy improv music that teeters between jazz and rock containing tons of interesting sounds this could prove most enjoyable. For more information you can email Hard as Kerosene at njhamlyn@netscapeonline.co.uk. Contact via snail mail c/o Nick Hamlyn; 293 Wellingborough Road; Northhampton; NN1 4EW; UK.